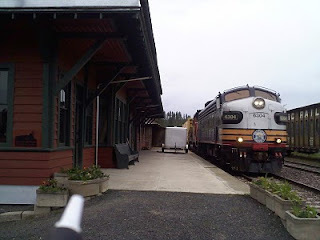 Sometimes progress at the depot is as slow as the W&I Railway's F-Unit chugging into Potlatch (pictured above with Don Somers out to greet Joel King in the locomotive). But there are some new happenings. Yesterday Karen Rohn and Julie Kerr met with Jack and Don to review terms of the lease. And phone service was installed. That means the new business --Blackbird at the Depot --is closer to moving in and opening its doors. The word is also out that the speeder rides in Palouse will be a new addition to the fun this year. No presale tickets for the rides, but speeders will be on hand on July 10 from 11 am to 1:30 pm, with ride tickets being sold at the Palouse RV park. The tickets are $5 for adults and $3 for 12 and under, with a route going between the park and E Street. 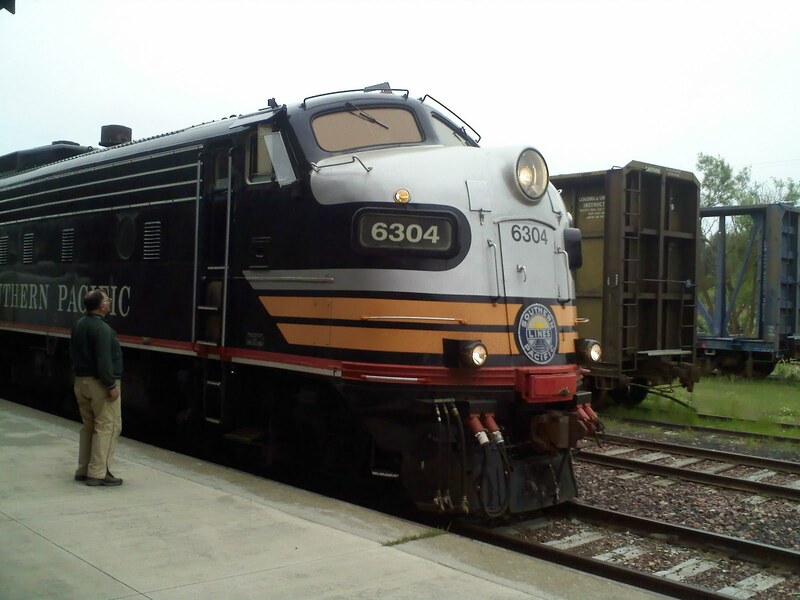 It's a great event for Palouse and a good option for parents wanting to take the kids on their first ride-the-rails excursion. If you are one of the many dropping in at US Bank in Potlatch to buy pre-sale speeder tickets, you will recognize Carol Cooley, one of our most loyal volunteers. Carol helped spruce up the depot for the speeders last year and the year before (that's her pictured last year cleaning every window on the lower floor! ), thanks to the US Bank community volunteer program. Carol and branch manager Kenny Cada also take on the duties of selling pre-sale tickets for the speeder event. This is no small job, especially when the tickets sell out quickly for some of the rides. We can never thank these ladies enough for their enthusiasm, accuracy and care in helping us with the big event coming up July 10! As for progress at the depot, it still often feels like things will never be done. Shane Bartlett was busy working on the wiring again today, and Jim West took another day of leave from his job in Coeur d'Alene to keep chipping away at drywall installation and the like. I don't know how we can ever thank Jim enough for his dedication as Project Manager. He has given his all, and we hope and pray his back holds out after all the punishment he gives it! Not to be forgotten are the almost-daily contributions of Don Somers, Brian Magelky and Jack Coyner. Tomorrow Verizon shows up to hook up phone lines for Karen Rohn and Julie Kerr's new shop BLACKBIRD AT THE DEPOT, and the WIM HPG, which will share a line with the Trailways Bus service. That makes it seem like the enterprise is actually for real. Tickets went on sale yesterday for the July 10 Speeder Event and already almost all the presale tickets are sold for the extended Palouse ride. People are reminded that there's lots to do in Potlatch that day too. Jim West, our Depot Project Manager, doubles as an outstanding musician and he and the Two Dollar Bills will be on stage during the speeder activities. Other bands will be there as well. In the not-too-distant future, the Benx boxcar will be moved farther down the track to a new location with covered seating. Not this year, but hopefully next year, speeder fans and musicians will have a whole new venue. There's a lot that goes into each speeder event and we thank Don Somers and Jim West for heading up the weekend activities. Visit the blog often to see what's happening with the HPG ... and consider joining the WIM HPG, an organization that gets things done!!!! Sunday found Jim and daughter Tori working on the platform in the freight room (pictured above), and Mike Bryngelson putting the final coat of finish on the temporary floor in the ticket office. Once again, Jim brought daughters Tori and Delaney along to put some sweat equity into the building, no small sacrifice considering the West family could've been boating on Lake Coeur d'Alene or something like that! Thank you Jim for giving up so many weekends for the non-paying job of "project manager" at the Potlatch depot. It is gratifying to know that Tori, Delaney and Aaron Magelky, members of the younger generation, are also invested in the history of the railroad and company town. And Mike is a new convert to the project, as well. We appreciate all of you volunteers. It's always helpful to look backward when the work goes on and on! The photo above is from 1996 and shows then-mayor of Potlatch Scott Kammeyer with Potlatch Elementary School special education teacher Cindy Braun. 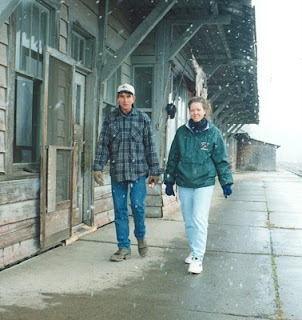 The two were touring the old WIM depot with an eye toward getting the building restored. Scott kicked of the pursuit of an ITD grant and Cindy had her gifted and talented class reviewing depot history and writing reports. Fast forward and the depot is no longer faded gray, and thanks to plenty of sweat equity, the interiors are coming along, as well. Architects estimated that interior work would require perhaps a half million dollars, but devoted volunteers have logged over 1000 hours of donated labor in two months, and $35,000 just keeps on stretching. We have electricity and plumbing, fresh paint, restored floors and a long list of other civilized conveniences in the north end of the downstairs. There was a set back last week as the building inspector asked us to replace the sheetrock with commercial grade, but we also had a volunteer stop by who is a professional sheetrock hanger. He has volunteered some hours for the future. With interiors coming together, future tenants Karen Rohn and Julie Kerr are getting ready to move in. Stay tuned. And be sure to review past postings on this blog to learn of the upcoming Speeder Event and other noteworthy accomplishments at the depot! Speeder Ride Tickets Go On Sale! It's official! Speeders come to town for rides on July 10-11, and reserved tickets are available starting Monday May 17 at US Bank in Potlatch. The fun begins on Saturday July 10 at 9 am and routes include round trip to Princeton or Kennedy Ford for $15, or $10 for 12 and under. If you buy on the day of the rides, tickets are $10 round trip, or $5 for age 12 and under. RESERVE TICKETS GUARANTEE YOU A RIDE AT A SPECIFIC TIME! New this year is a great excursion to Palouse, Washington, lunch in the park, shopping along Palouse's fun Main Street, then a ride back. The route includes passage along the Palouse River and some very nice scenery. That trip departs at 10 am from Potlatch and boards in Palouse at 1:30 pm for the ride back. Fare is $40 for this round trip, with ages 12 and under going for half price. Reserved tickets available at US Bank starting May 17. While round trip riders enjoy Palouse's amenities, shorter rides will be offered around Palouse from approximately 11 am to 1:15 pm. Stay tuned for further announcements as details are worked out. 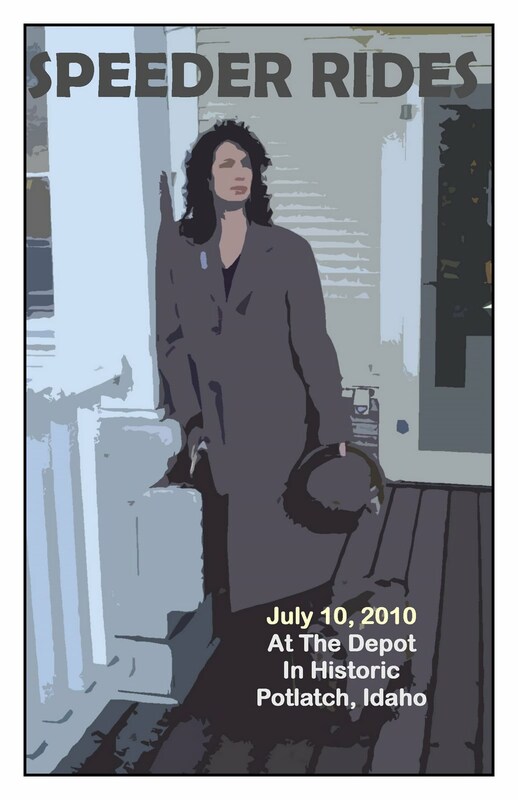 Poster above courtesy of Karen Rohn, who will be opening a shop in the depot in the near future. Work continues on the depot and this weekend the focus has been on replacing the worn parts of the floor in the ticket office. Thanks to Jim, with some help from Don and Jack, there's a new chipboard insert that will be sanded and finished by Jesse Glassman next week. Meanwhile, Karen and Julie painted some pleasing dark gray on window frames to make a great look in the waiting room, and Brian and Aaron are staining the doors. Lookin' good guys!